Among the five National Law School Delhi Graduates who have made it to the merit list of the UPSC Civil Service Examination, 2017 is Ms. Saumya Sharma. She has managed to beat all odds and secure 9th rank in her first attempt, despite her hearing impairment. However, this isn't the first time that she has made headlines. 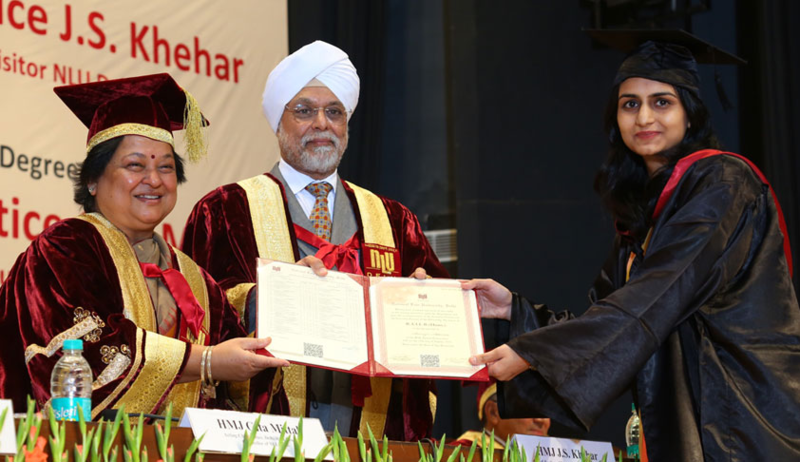 Back in 2016, when she was a final year student, Saumya had drawn the attention of the Delhi High Court towards the advertisement notifying the Delhi Judicial Services Examination, 2015 and the ‘important instructions’ annexed thereto. The advertisement had limited the relaxation of 10 years in the upper age limit and horizontal reservation of 3% available to the Physically Handicapped candidates to only the visually and orthopedically-disabled. The letter demanded that the benefits be extended to those with hearing impairments as well. While she had acknowledged a Ministry of Social Justice and Empowerment (MoSJE) notification stating that jobs of judges and magistrates subordinate in lower judiciary are not identified for hearing-impaired candidates, she had elaborated on reasons why the notification was not binding on the Delhi High Court. She had also placed reliance on the judgment in the case of Union of India v. National Federation of the Blind [(2013) 10 SCC 772], wherein the Supreme Court interpreted Section 33 of the erstwhile Persons with Disabilities Act of 1995 to mean that every appropriate government has to appoint a minimum of 3% vacancies in an establishment, out of which 1% each shall be reserved for persons suffering from blindness and low vision, persons suffering from hearing impairment and persons suffering from locomotor or cerebral palsy in the posts identified for each disability. Having cracked the UPSC now, she is sure to bring about more positive change in the system. We wish her all the very best for her future endeavors! "Saumya was in my courses on constitutional law and comparative rights adjudication and put in a particularly impressive performance in the seminar course on comparative rights. Saumya always had that rare quality that you seek in students - the ability to speak truth to power. Intellectually very sharp and always well prepared, Saumya never hesitated to articulate her views, however unpopular or non-traditional those views might have been. And it came to the fore in the manner in which she took up the issue of benefits not being extended to the hearing impaired in recruitment for the Delhi Judicial Services. I am sure she will be an incredible asset to the bureaucracy of this country and is a name we are bound to hear often in the decades ahead." Note: In the 2017 examination, 29 physically disabled persons- 9 orthopedically handicapped, 8 visually challenged, and 12 hearing impaired- got selected.